Ore 15:00 - Sfida di «Braccio di Ferro» con la partecipazione del gruppo «FRIUL ARM WRESTLING» aperta a tutti. Ore 23:00 - Live Music Concert con il gruppo «FRAMMKENSTEIN» Tributo Rammstein. 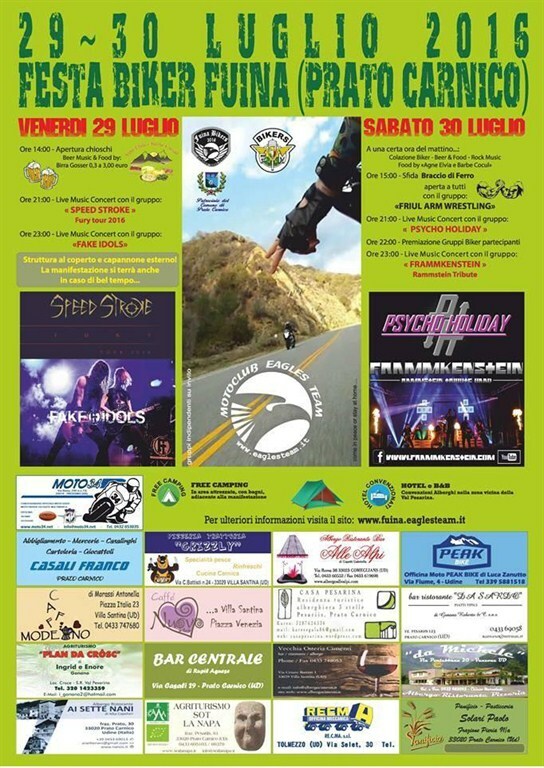 At a certain time in the morning ...: Biker Breakfast - Beer & Food - Rock Music, cooking with local products prepared by the Carnia "Agne Elvia and Barbe Cocul"
At 3 pm - Challenge of "Strong Arm" with the participation of the group "FRIUL ARM WRESTLING" open to all. At 11 pm - Live Music Concert with the group "FRAMMKENSTEIN» Rammstein Tribute.